For many decades, the diamond industry overlooked the bloody origins of its product. The industry’s lack of vertical integration and reliance on relational exchange—using layers of middlemen—made it difficult to trace diamonds’ sources. Ethnic trading networks have long operated in Africa and purchased diamonds from military warlords. Because the stateless commercial structure of the industry made these “conflict diamonds” difficult to trace—they were routinely funneled to Antwerp and mixed with diamonds from conflict-free sources—it was impossible to police their sales. In the 1990s, social activists and large NGOs organized protests and media campaigns to raise consumer awareness of this troubling phenomenon, threatening global demand for diamonds and inducing the industry to develop a solution grounded in international law. The outcome was the Kimberley Process Certification Scheme (“Kimberley Process” or “KPCS”), whose purpose was “to ensure that diamond purchases were not financing rebel movements and their allies seeking to undermine legitimate governments.” This essay explores the history of the Kimberley Process; assesses its successes and failures in the fifteen years since its implementation; and proposes institutional reforms to close loopholes in an international legal framework that relies on self-policing. The story of the Kimberley Process illustrates the complex nature of the corporate-state relationship and its role in enabling and perpetuating human rights abuses. In 2000, the United Nations released a report (“Fowler Report” or “report”) on the sanctions regime against the rebels of the National Union for the Total Independence of Angola (“UNITA”). The author of the report, Robert Fowler, had been appointed by the Security Council with a mandate to investigate violations of the 1993 UN arms and petroleum embargo against UNITA following the resumption of Angola’s civil war in the 1990s. UNITA had continued to receive military equipment despite the UN embargo, which enabled it to continue financing the conflict. The Fowler Report found that UNITA had exploited the lack of regulation of the diamond industry to sell or barter diamonds for cash or weapons. It exposed a number of UNITA’s schemes, including one in which a former DeBeers stockholder worked with the government of Zaire to supply arms to UNITA from 1993-1997. The report also estimated that UNITA had made approximately $3.7 billion—93% of all diamond sales during that period—despite international sanctions. Heeding the Fowler Report’s findings and recommendations, diamond-producing nations convened in Kimberley, South Africa, and together established the Kimberley Process Certification Scheme. Implemented in 2003, the Kimberley Process unites governments, civil society organizations, corporations and individuals around the goal of “stemming 99.8% of the global production of conflict diamonds.” It is a “binding agreement that imposes extensive requirements on every participant,” according to the Kimberley Process website. The program’s function relies in part on certification and in part on coordinated boycott by requiring diamond-producing countries to label and certify that its diamond exports do not finance entities seeking to overthrow democratically elected governments. Additionally, it requires the 81 member nations (including the major diamond markets) to prohibit diamond trade with nonmember countries. 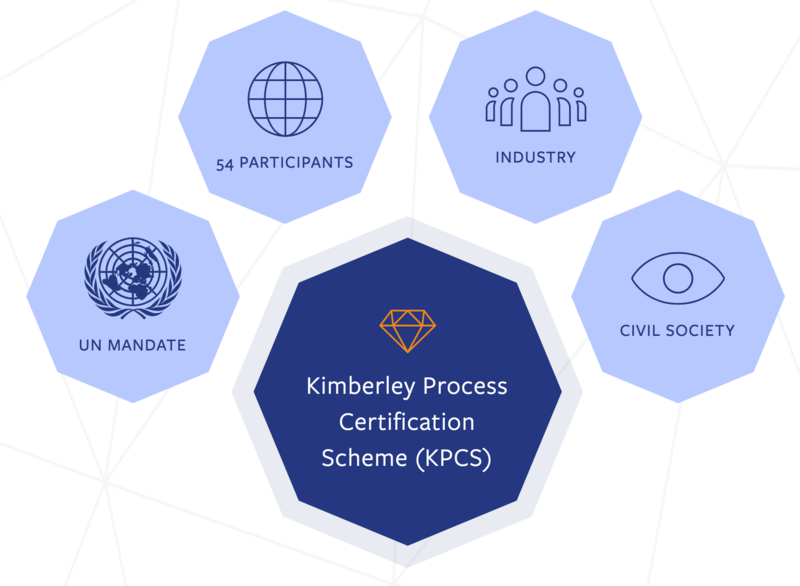 Participants in the Kimberley Process must fulfill four major requirements: (1) Establish national legislation, institutions and import and export controls to satisfy the minimum requirements of the binding agreement; (2) commit to transparent practices and to the exchange of critical statistical data; (3) trade only with fellow members who also satisfy the minimum requirements of the agreement; and (4) certify the shipment of the diamonds as conflict-free. By removing conflict diamonds from the global market, the Kimberley process compelled the participation of industry leaders—namely DeBeers. Not only did it remove the threat to demand for its products, which had resulted from the media-driven public outcry over conflict diamonds, but it also gave DeBeers a larger market share by excluding a major source of competition. Figure 2: DeBeers makes reference to the Kimberley Process numerous times on its website. While there is ample evidence demonstrating the success of the Kimberley Process in significantly reducing the flow of conflict diamonds in the industry’s mainstream channels, there are several aspects of the regime that have been subject to widespread criticism, particularly in recent years. The major pillars of the regime—transparency in its implementation and the integrity of the certifications process—have been called into question. In 2011, Global Witness, a leader in the media campaign that brought attention to conflict diamonds, ended its partnership with the Kimberley Process, citing its objections to the ineffectiveness of the regime’s certification process that authorized the sale of conflict diamonds from companies operating in the Marange fields in Zimbabwe, an area over which the Zimbabwean army had seized control in 2008, “killing about 200 miners in the process.” This loophole in the certification process has been attributed to various design flaws in the regime. First, the terms of the certification process focus solely on the need to prevent the mining and distribution of conflict diamonds, leaving broader issues like exploitative labor policies, poor working conditions and child labor, and the displacement of entire populations unaddressed. Figure 3: A map showing the global nature of the issue. The problem with a system of self-policing is that there are no adequate checks for guaranteeing enforcement. For the Kimberley Process, the least institutionally disruptive way forward would be to pressure other participating countries that are major diamond importers to stop importation from exporting countries that are violating the letter and spirit of the KPCS. As Ian Smillie, one of the early architects of the process and an authority on conflict diamond, puts it, “if the U.S., which is the biggest consumer of diamonds in the world says, ‘listen, if the Congo is unable to enforce the minimum provisions we will no longer allow the importation into the United Sates from the Congo until they clean up their act,’ you would see a huge amount of action take place in the Congo.” But expecting the most powerful participating countries to guarantee the enforcement of the certification process may end up perpetuating an already-existing power imbalance in the Process’ framework. Figure 4: A graphic showing how blood diamonds arrive in the U.S. The success of the Kimberley Process depends, in large part, on voluntary participation, self-policing and peer-review. But the U.S. government’s failure as the largest importer to adhere to the requirements, coupled with the loopholes in the requirements themselves, are clear indicators of the structural problems inherent in a regime that relies solely on these three pillars to ensure its relevance and effectiveness. Of course, this problem is not limited to the KPCS, nor is it a new phenomenon. It simply reveals the inadequacies of a state-centric international legal order that gives rise to a system of private governance. Without an independent entity to provide effective oversight and enforce the certification requirements, states are left with little incentive to adhere to them. In fact, this governance structure provides perverse incentives to the most powerful importing states to tacitly encourage bad behavior by the weaker exporting states in order to continue profiting from their unethical practices. Despite valid criticism of the Kimberley Process, there is no denying that it has been effective at stemming the flow of conflict diamonds in the mainstream pipeline. And, while there are no easy fixes to the structural problems inherent in the regime’s design, there are still several institutional reforms that the Kimberly Process can undertake to impose stricter requirements on participating countries in order to close loopholes through which illicit conflict diamonds continue to enter legitimate channels. These are similar to the recommendations that Global Witness made in a 2007 statistics review report that “uncovered millions of dollars worth of illegal and suspicious trading.” The measures include, but are not limited to: (1) adopting a mechanism for independent crosschecking of internal Kimberley Process statistical data with verifiable external sources; (2) adopting independently auditing diamond companies’ Kimberley Process certificates, records of trades and stocks and systems of warranties; (3) requiring participating countries to adopt requirements for polishing factories to maintain records on rough, polished and residual diamonds in order to curb the flow of illicit trade; and (4) placing additional restrictions on diamond producers to comply with international human rights laws and bring an end to exploitative labor policies and child labor. Of course, these are merely recommendations for adopting more rigorous accountability mechanisms, but they still rely on a system of self-policing. Nevertheless, short of establishing an independent enforcement agency to oversee compliance with the Process’ basic requirements, KPCS officials should at least attempt to buttress the requirements with additional safeguards by strengthening cooperation with participating countries’ law enforcement agencies. The establishment of the Kimberley Process in 2003 was a response to consumer outrage over a media campaign that brought to light diamonds’ problematic origins. As this paper demonstrates, there are several reasons for the agreement’s failure to live up to its promise of stemming the global production and trade of conflict diamonds. The most glaring problem is the certification scheme’s narrow terms of certification, which focus exclusively on the mining and distribution of diamonds, leaving broader human rights issues around worker exploitation unaddressed. This problem can be solved by broadening the definition of “conflict diamonds” in order to include prohibitions on child labor and other exploitative labor policies involved in diamond production. Ultimately however, the regime’s failures are attributable to the broader systemic inadequacies of self-policing that are not unique to the Kimberley Process. Short of a fundamental reimagining of the global economic architecture, it is difficult to find meaningful solutions to the enforcement problem. As long as the international legal order continues to give the most powerful actors unfettered discretion to write the rules of the global market economy, states will continue to have little incentive to confront this pervasive challenge. See generally Barak D. Richman, Stateless Commerce: The Diamond Network and the Persistence of Relational Exchange, 2018 (describing how ethnic trading networks operate in the diamond industry and why they persist in the twenty-first century). What is the Kimberly Process? https://www.kimberleyprocess.com/en/what-kp (last visited May 1, 2018). United Nations Report, S/2000/203, Violations of Security Council Sanctions Against UNITA, Mar. 10, 2003 [Hereinafter “Fowler Report”]. What is the Kimberley Process? https://www.kimberleyprocess.com/en/what-kp [last visited: May 1, 2018]. Richman, supra note 1, at 143. See Alan Cowell, Controversy Over Diamonds Made Into Virtue by DeBeers, N.Y. Times (Aug. 22, 2000), https://www.nytimes.com/2000/08/22/business/controversy-over-diamonds-made-into-virtue-by-de-beers.html (stating that DeBeers “[h]as effectively enlisted the United Nations as a policeman to do the job that dictators and mercenaries once did in keeping more desperate competitors from dumping cheaper stones onto the market.”). DeBeers, https://www.debeers.com/ [last visited May 1, 2018]. Richman, supra note 1, at 144. See generally Audrie Howard, Blood Diamonds: The Successes and Failures of the Kimberley Process Certification Scheme in Angola, Sierra Leone and Zimbabwe, Wash. Uni. Global Studies Law Rev. 15 (2015) (detailing the history of the history of the KPCS and noting the extent to which its implementation has been effective in Angola, Sierra Leone and Zimbabwe, while also identifying the current status of blood diamonds in each of the three countries). This entry was posted in Papers, Uncategorized. Bookmark the permalink. 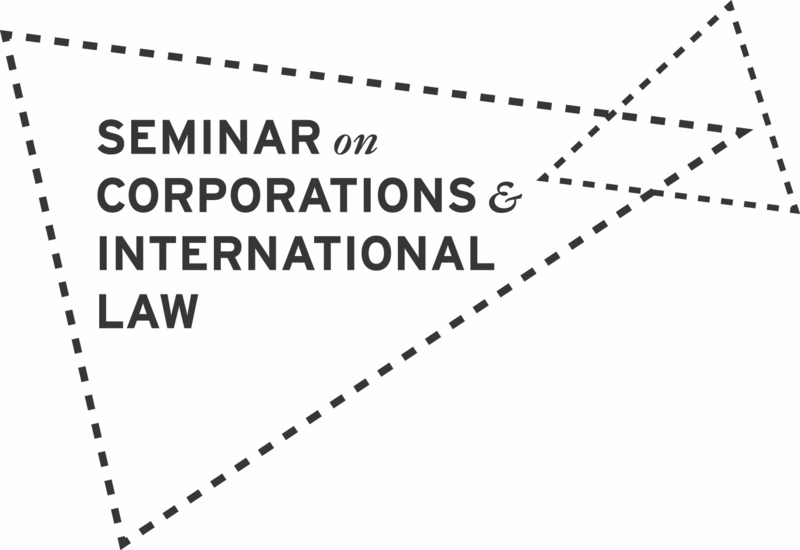 Corporations and International Law is powered by WordPress at Duke WordPress Sites. Please read the Duke Wordpress Policies. Contact the Duke WordPress team.